AMC Trails Blog: What is she doing? 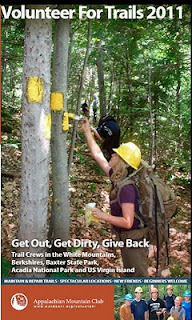 We have received many comments from our Trails Volunteer community asking about the cover photo on the 2011 Volunteer For Trails brochure. First of all, we want to thank all of our trail volunteers for being so attentive and critically looking at the photos in this publication. Many of you saw this photo and immediately asked why there were so many blazes on that trail! In fact, this is a photo of one of our teen Volunteer Trail Crew members repainting survey markings along the Appalachian Trail corridor boundary in the southern Mahoosucs, NH. 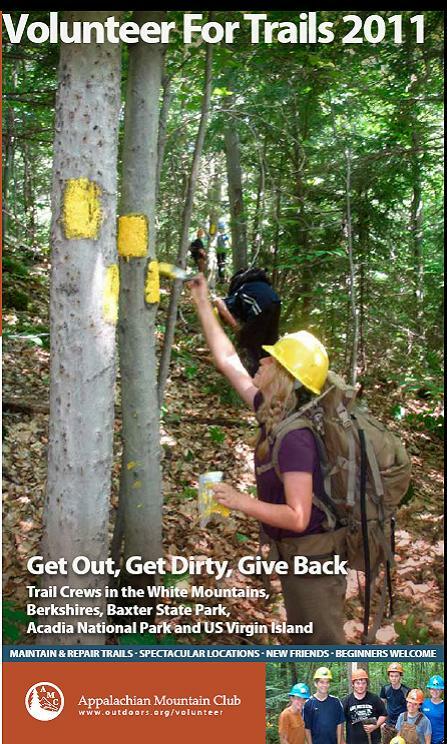 2010 was the third summer in which AMC Teen Volunteer Trail Crew programs helped with the AT Corridor Boundary management in the southern Mahoosucs. This work helps to maintain an obvious property boundary between National Park Lands (protected as part of the Appalachian Trail-National Scenic Trail) and private lands. OK, we should have put a caption on that photo.. but, it's great to see such an active response to our printed materials. Thanks and we hope to see you on the trails!